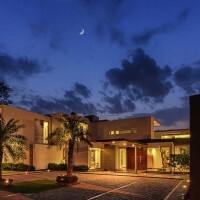 DADA Partners have designed the Center Court Villa in New Delhi, India. 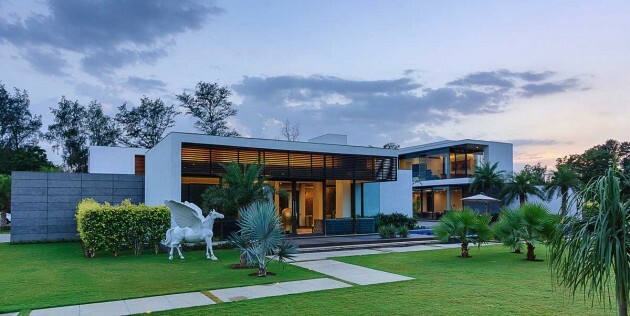 The clients’ brief for a personal residence placed on a 2.5 acre plot of land, was to have a six bedroom home with indoor/ outdoor living areas and a large entertainment space. 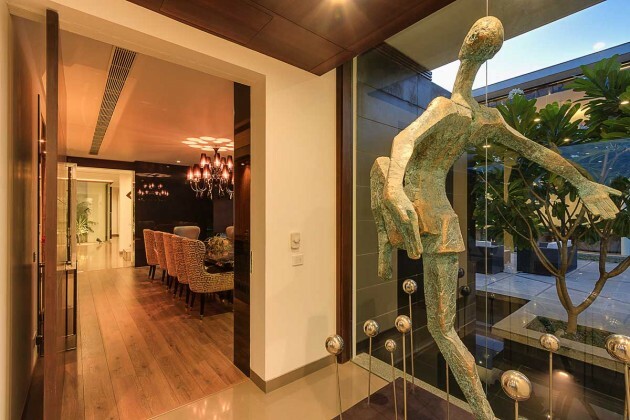 Clients’ inkling towards contemporary aesthetics, informed the building design with clean horizontal lines, sculptured rectangular forms, large expanse of glazing and wide sliding screens creating the desired visual delight. 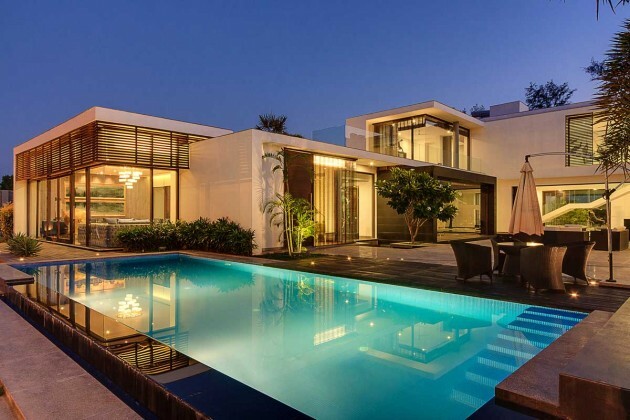 The villa is designed with two sets of parallel masses with another volume perched above, perpendicular to the former creating two courtyard spaces. The two courts, one to north and the other facing south resulted in a H-shape configuration. 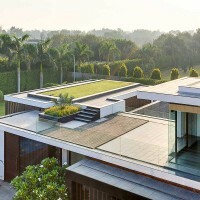 All functions are programmed around these two courts so as to provide maximum unhindered views of the landscape from almost all habitable rooms. 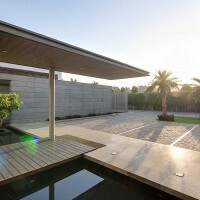 Strategically placing the pool to adjacent to the north court contained this space and formed the focus of the project, hence the name ‘center court’. 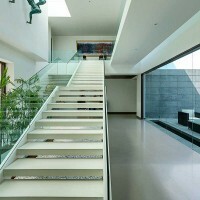 Other smaller internal courts helped to achieve maximum natural daylight to interior spaces of the house. 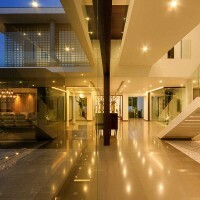 The volume to the east is occupied by formal program such as the Entry foyer, formal Living room and the dining area. This formal zone is primarily a single storey volume with high ceilings. 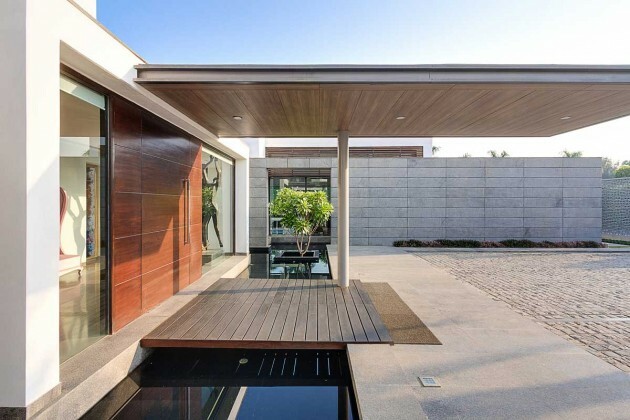 A timber and steel bridge spans over a reflective pool connecting the drive court to the entry foyer. 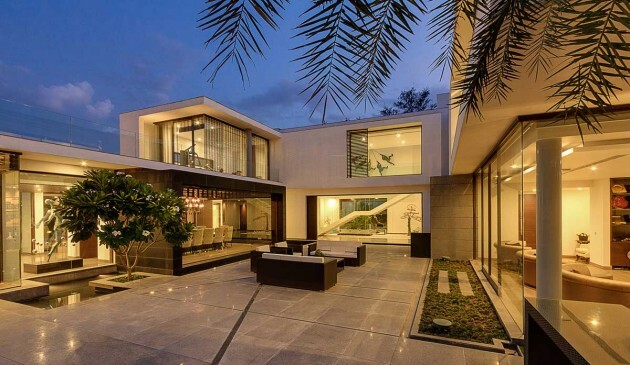 The access to the house is shaded by an extended canopy that cantilevers out over the drop off. The part to the west is more of a private zone. All bedrooms and family areas are in this area occupying both floors of the house. The placements of the bedrooms are such that they face the private green lawn on the west side maintaining more privacy for the occupants. 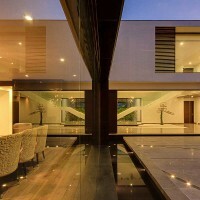 The reflective pool along the drive extends the length from the Prayer room on the left to the formal living room to the right. 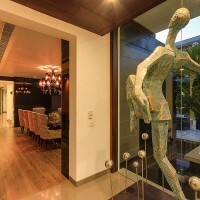 A granite clad stone wall part of the water body, forms the focus at the entry court with the high volume of living room visible behind it. The living room and adjoining bar with floor-to-ceiling glazing faces the swimming pool in the foreground and the vast green lawn expanse beyond. 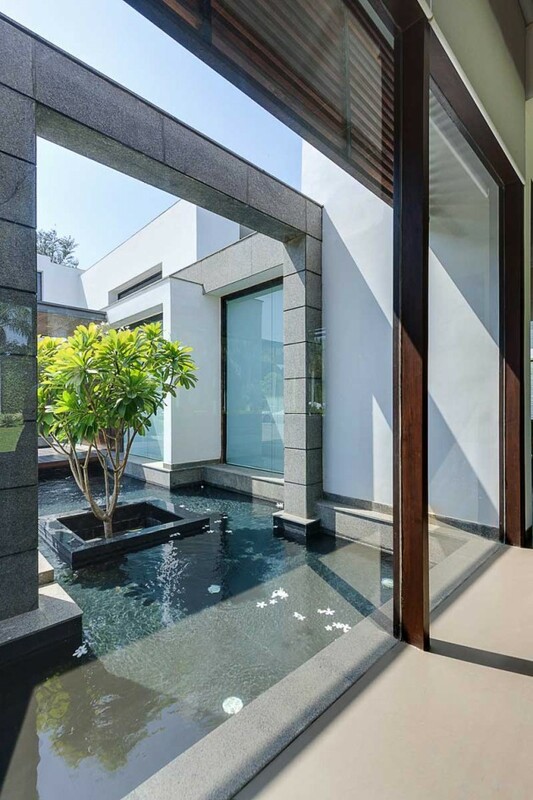 The manicured landscape and this hall seamlessly become a single space once the doors slide open. The south face of the Living room overlooks the entry water feature with the free standing granite stone feature wall. The dining area is aligned with the central court leading to the pool outside the patio in front of the Formal living and bar. Opposite the dining room to the other side, is the multimedia hall. With the placement of the projection screen at the end wall one can view it from not only the courtyard, but from across the dining space as well. 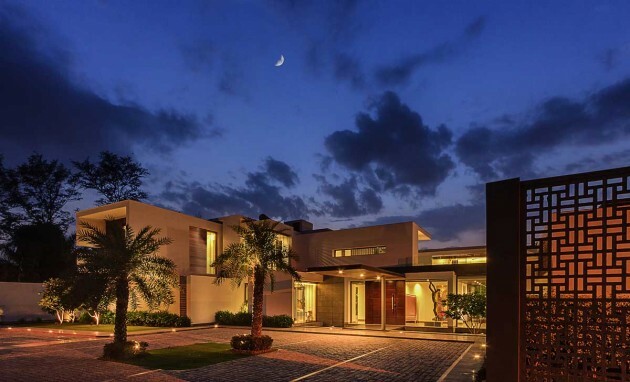 The west block of the building helps in shading/cooling the central courtyard during summers. 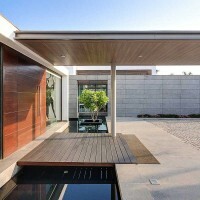 This coupled with the pool creates a cooler microclimate in the center that further enhances natural ventilation in the house through this space. 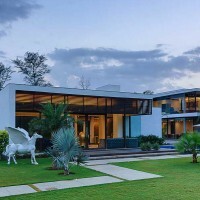 The upper floor comprises of four bedrooms in all with two being the master suites housed in the west wing. While one suite faces the private greens to the west the other one has views of the north court and the pool from above. This master bedroom has a connecting lounge with glass walls and boasts of an extended covered terrace that feels part of the lounge. The other two bedrooms are in the east wing. 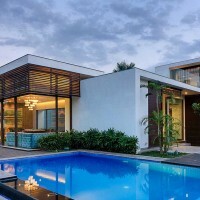 A small gymnasium with a connected outdoor landscaped terrace makes it perfect for morning sit out. 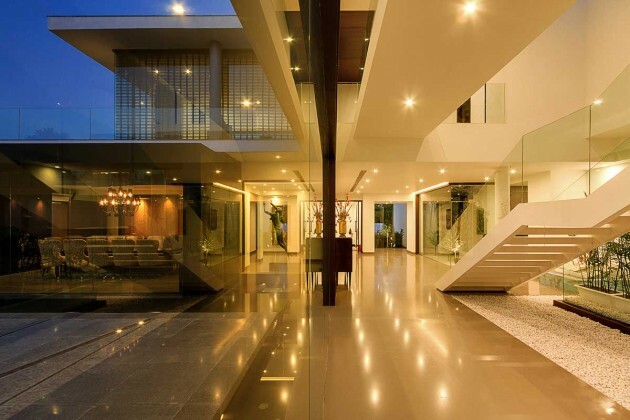 Both floors are linked through a central double-height space containing a sculpted staircase. This wing forms the main passage connecting the two masses on the east and west on the ground floor as well. 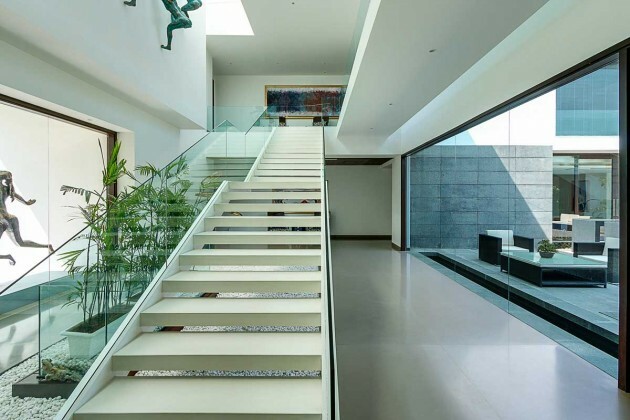 The striking white staircase with floating steps and glass railing stands out against white walls making the space minimal and very calm. 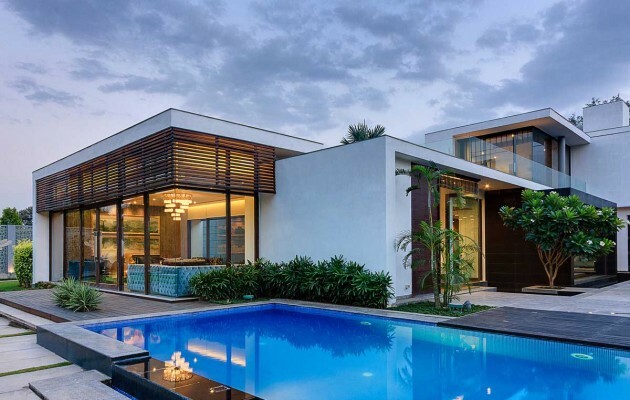 This central double-height wing has full glazing on either sides and overlooks the long, rectangular pool to the north court. 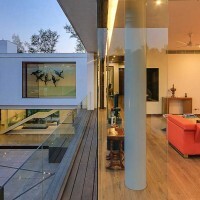 Walking through, one can view both courts on either sides simultaneously as if the passage is part of the landscape. 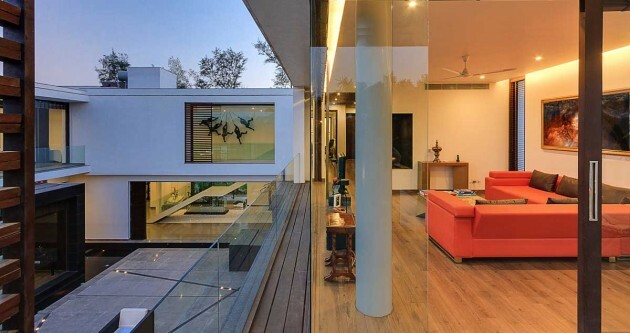 The interiors are strongly interconnected with the exterior spaces and the choice of materials play with the two realms. Interior spaces are intentionally very minimal. 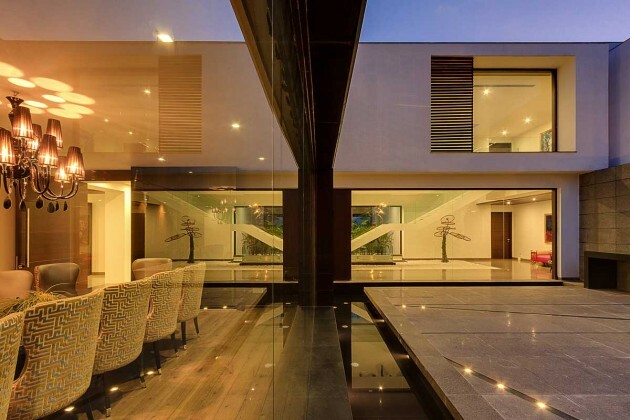 With vistas in all directions, large expanses of glass allow the landscape views to provide the visual experience that the client had originally requested for.